Recurring tasks are generally schedules with scheduled task manager. 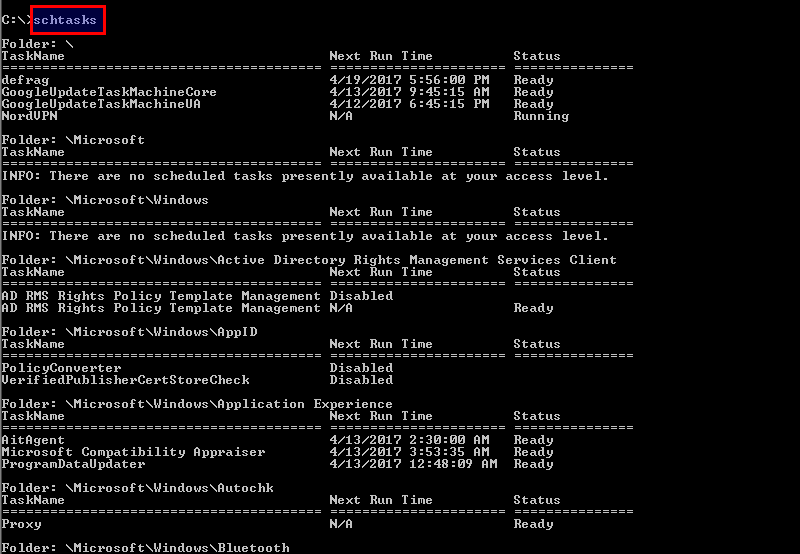 Scheduled task manager have GUI for management but creating a task in 20 different servers is very hard and trivial job. Windows operating systems provide tool called schtasks which is used to create, modify, delete scheduled tasks. 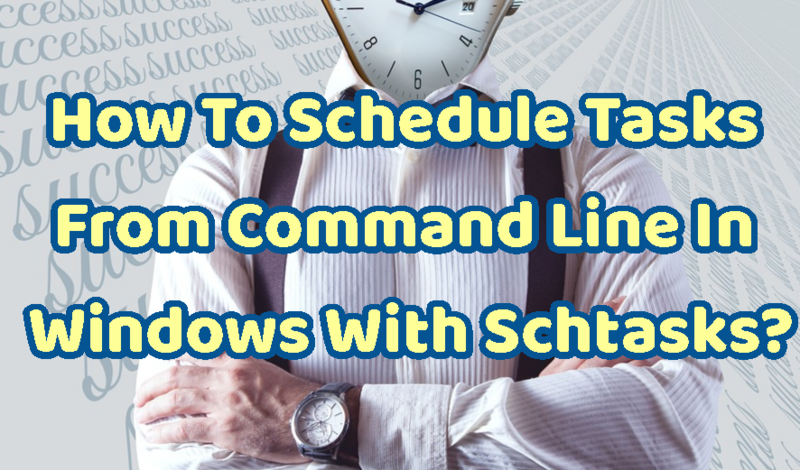 Help about scheduling tasks command schtasks can be printed with /? option. While using command we will use following syntax. In order to create a scheduled task we need to provide following parameters at least. /TR specifies the tasks executable file or command. In this example we will create a task named defrag which will run c:\windows\system32\defrag.exe at weekly periods. While creating scheduled jobs we can providing following attributes. valid values are “”, “NT AUTHORITY\SYSTEM” or “SYSTEM”. minutes. Valid range: 1 – 599940 minutes. LEARN MORE How To Remove All Docker Container Images? In a IT environment there will be a lot of existing scheduled jobs. We can list these existing tasks just issuing schtasks like below. For each task following information is printed. Folder shows namespace based location. 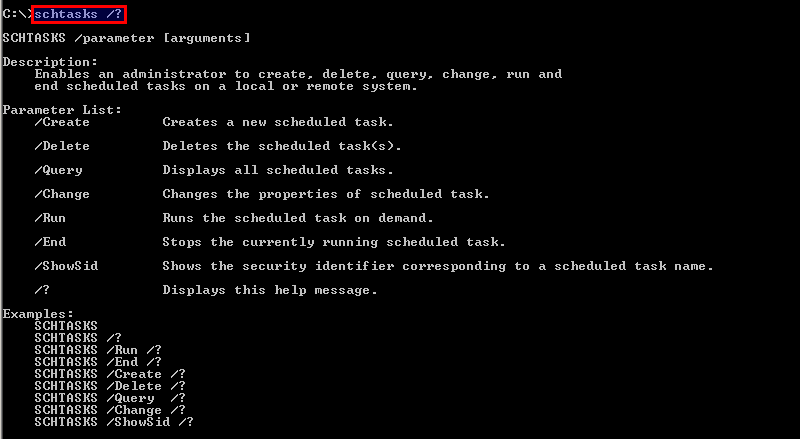 Status shows whether the task is ready to run or running or there is a problem. All ready scheduled jobs can be deleted if we do not need it. We can delete task with /delete option and specifying the task name. In this example we will delete task named degfrag which is specified with /TN option. While deleting we need to confirm the delete operation. If the task is deleted properly we will get a SUCCESS message. If we do not need all of the scheduled jobs and we want to delete them in a single shot we can use asterisks * sign to specify task name. Some time we may need to disable scheduledjob for a short period. We can use /change option with /disable option in order to disable a scheduled job. In this example we will disable the job named defrag . We can enable scheduled job similar to disable operation where we use /enable . A scheduled task can be changed with /change option. We can specify the attribute we want to change. In this example we will change the username and password of the user which will run task with /RU and /RP .